No doubt, your best one yet! Maybe CRAP can hire two Indians instead of me. The problem in our CRAP Team is that since I do the job of two CRAP Isreali developers, one CRAP QA, two CRAP SM, one German architect and let's not forget I manage thyself... Can CRAP calculate how much Chinnese Developers they need in India instead of me while I sing LA CUCARCHA on my way out? As a matter of fact, nationality has no relation with coding, contrary to people in last posts, I work as a System Engineer and I've seen chinesse, indian and mexican code, which sometimes is better the mexican. 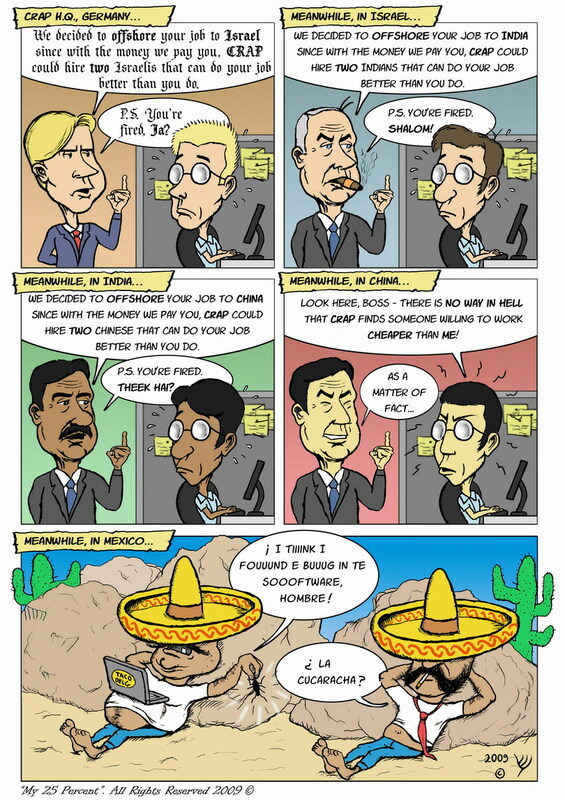 The problem here as you noticed (hope so, otherwise you are not kind of intellegent), are the countries they work in, India, China and Israel, have better economies than Mexico, and if we go down you could in a time, find that with the salary of one mexican developer, you could pay for two african (whatever country it is). These societies has no other choice more than accept whatever paid rate, is not they work worst. Hope this ad is useful for those people who work in those country, at least to realize their situation.